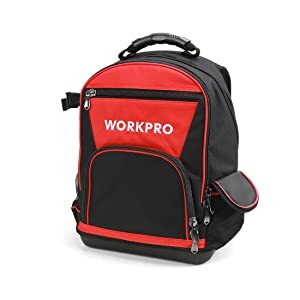 Best Tool Backpack For Electrician: Only Top-Rated in 2019! 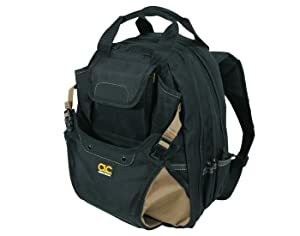 Looking for Comfortable Backpack for Electrician? Here’s a Fresh List! A tool backpack is one of the best and most reliable ways to carry all your necessary tools for work. Usually, people buy carriers, however, when they are fully loaded, to carry one is a hassle. A backpack with lots of pockets and belts that will help you to place all your tools just how you want and just as it is convenient for you is the best idea. No matter how heavy your backpack with tools is, it is definitely easier to carry it on your back than in one hand. We found 4 amazing backpacks that provide more than 40 pockets for small and big hand tools as well as for drills, extensions cords, pliers, screwdrivers, wrench sets, drill bits, testers. Review them, compare features, and choose the best one for your work. This is a durable and practical backpack with 48 pockets (41 inside and 7 outside) to smartly organize space and all your necessary hand tools and electrical tools for work. There are two main zippered compartments, one for tools and parts, one for a cordless drill and battery. Also, there is an adjustable compression pocket for bulky items. The backpack provides a great support for your back, allowing you to use shoulder and chest straps. There are exterior pockets and reliable handles at top. 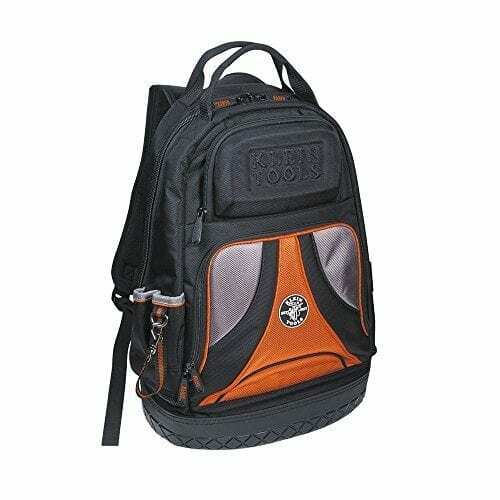 This is another comfortable and reliable tool backpack for electricians. The backpack is looking good from outside and provides maximum comfort for a back. The bag offers 39 pockets that will allow you to organize all your tools and accessories in one carrier. The bag is featured with reliable zippers that ensure smooth operation. Also, there are some front zipper pockets for small parts and tools like nails. Specially molded bottom will protect your tools in case the bag falls or you put it on a wet surface. Klein tools is a major and famous tool manufacturer that focuses on electrical and utility applications. This is a super durable and handy bag because it is featured with 57 pockets. There are 48 multi-use inside pockets and 9 exterior pockets, therefore, you will definitely have enough space for organizing all your tools, accessories, and personal things as well. The bag has a LED light that can be directed at your work area, or you can use it in darkness to find the necessary tool. The light can be adjusted to 3 different levels to perfectly match your needs. The bags storage space allows carrying drills, extensions cords, pliers, screwdrivers, wrench sets, drill bits, testers and more tools and accessories for electrical works. The backpack has large pads on back for extra comfort and support and padded web carrying handles. 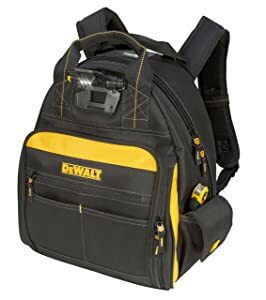 Dewalt is American brand of innovative high-tech power tools, tooling, accessories, clothing for construction, etc that is famous all over the world. This is a more durable and convenient bag specially designed for electricians, as well as plumbers, or simply carrying tools. The backpack is featured with 60 pockets and 15 belts for organizing your working tools and accessories. The back of the carrier is padded, so you will feel comfortable even when your bag is fully loaded. Also, there are shoulder straps that will make carrying a full bag easier. The backpack has a molded bottom that will protect your tools from damage in case the bag falls or you put it on a wet surface. We would recommend you purchase item number 3 because it is the best electrician backpack due to its design, the number of pockets, and other features that it offers. Also, it has a LED light that is adjustable and so handy when you have to work in a dark room. You can use the light to find a necessary tool in your bag or direct it to the working area. Depending on the size of the backpack, the number of pockets and belts that will keep your tools, so select the item that matches all your requirements.